Following a diagnosis of IgA nephropathy, the renal function of a 25-year-old man declined rapidly, forcing the active outdoorsman to curtail his high-energy lifestyle. As the effects of the glomerulonephritis worsened, his nephrologist advised the patient that renal replacement therapy would be essential to preserve his health. As the young man prepared for dialysis, he explored the possibility of a living donor. 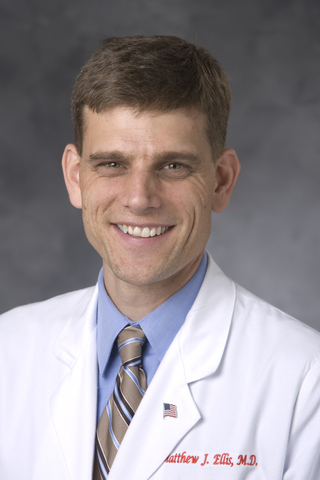 When that option became realistic, his nephrologist contacted Matthew J. Ellis, MD, medical director of the Duke Adult Kidney Transplant Program to initiate a referral. Question: What actions did Ellis and the Duke Adult Kidney Transplant Program take to protect the long-term health of the young patient? Answer: Within two months of referral, the patient underwent a successful kidney transplant with his mother as the donor. The timeframe for the evaluation and transplant was among the shortest in the history of the Duke Adult Kidney Transplant Program. The patient was placed on the organ wait list on May 11; the successful transplant was performed May 14. “From the time of initial referral, the process took just over two months,” Ellis says. “This was among our fastest transplants based on the two timeframes we measure, from referral to evaluation and from evaluation to transplant.” The time from referral to evaluation was 37 days, Ellis notes. The period from evaluation to listing was 28 days. Early referrals are critical to improved outcomes. “In this instance, the referring nephrologist called me personally to alert us that she had a patient who had a living donor already involved,” Ellis says. The transplant was performed within six months of beginning dialysis. A patient’s time on dialysis before transplant is a significant factor in outcomes. “Statistically, if we limit exposure to dialysis, patients do much better after transplant,” Ellis says. Each year spent on dialysis reduces the expected benefits of transplant, he adds. The rapid turnaround in this case from referral to transplant highlights the training and experience of the transplant team, which exceeds national and regional wait-time averages for referral-to-evaluation and evaluation-to-transplant. The Duke adult transplant program averages an approximately 40-day time from referral to evaluation—shortest in the region and two days below Duke’s own benchmark of 42 days. The average time between evaluation and decision-to-list is 90 days; the team’s goal is 90-to-110 days. “We push ourselves to become ever more efficient,” Ellis says. The timeframe from being listed to undergoing transplant ranges from a few weeks for patients with living donors to years for patients waiting for a deceased donor. By bolstering its living donor program and accelerating referral responses and pre-transplant evaluations—trends evident in the young patient’s case— the Duke Adult Kidney Transplant Program continues a rapid growth trajectory, more than doubling the number of annual procedures since 2012. During 2017, 178 adult kidney transplants were performed at Duke; in 2012, the volume was 82. The growth is particularly significant because of a decline in kidney donations across the United States during those years. The young patient’s transplant was unusually quick, Ellis says, but replicable for other donor and recipient pairs who arrive motivated to move quickly. “This case demonstrates how efficient we can be when the patient buys in, does the work to prepare, arrives with invested donor, and all the factors align,” Ellis says.